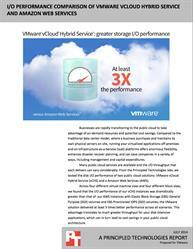 DURHAM, NC--(Marketwired - August 27, 2014) - Principled Technologies (PT) tested the disk I/O performance of two public cloud solutions, VMware vCloud Hybrid Service (vCHS) and Amazon Web Services (AWS), and found that the VMware option offered at least three times stronger I/O performance. PT discussed its results and methodology in a detailed report. A cloud service with greater throughput can boost the performance of disk-intensive applications and help you optimize your investment in the cloud. PT proved that vCHS could offer significantly stronger performance than AWS on both random and sequential workloads. If you're considering transitioning applications to the public cloud, check out the report at facts.pt/1pCtZui. 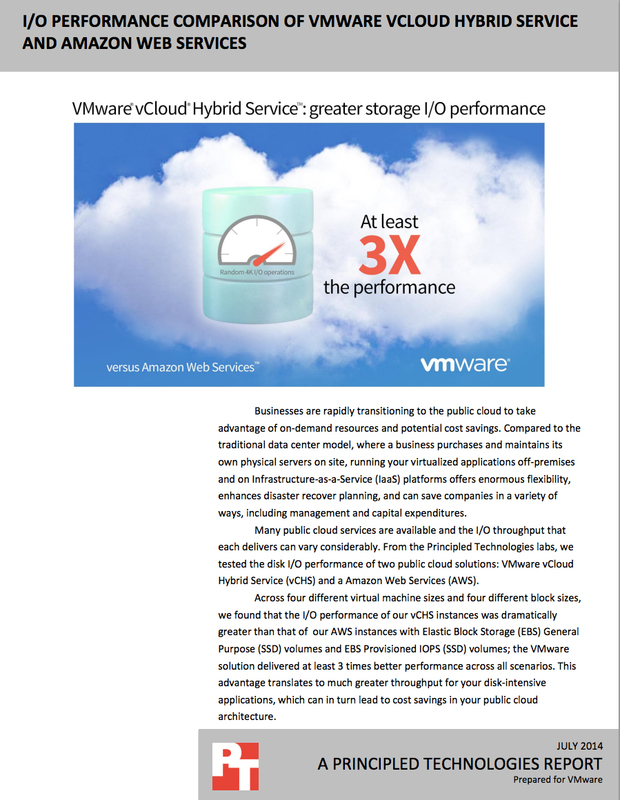 In all the scenarios PT tested, VMware vCloud Hybrid Service delivered at least three times greater storage I/O performance than Amazon Web Services.